Bill Holbrook’s reputation as the greatest cartoonist Auburn University ever awarded a degree to got even more secure Sunday. Alabama has nothing but fat elephants on the field. “With the college football season looming, I wanted to reach back and commemorate the contest held on November 30, 2013 between teams of elephants and tigers, otherwise known as the Iron Bowl,” the Kevin and Kell creator wrote in his daily post. Holbrook isn’t a stranger to poking fun at Bama, even unintentionally. 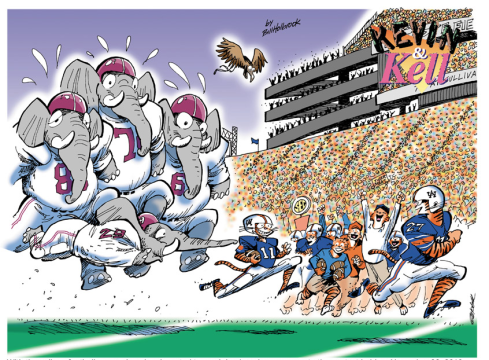 This Kevin and Kell strip from 2009 would have made for a perfect editorial cartoon during Bama’s deer antler spray scandal. The troglodytic depiction of a Bama player in his 1978 Iron Bowl comic for the Plainsman is also spot on. And then there’s the fantastic final panel on his epic The Thing That Ate Auburn. Check out more of Holbrook’s stuff here. Related: Bill Holbrook vs. 1978 McAuburn.